LC Paula and her au pairs at the U.S. Air Force Academy. Each month, our Local Coordinators (LC) plan a meetup for au pairs in their area. Events often include potlucks, hikes, or coffee catch ups. 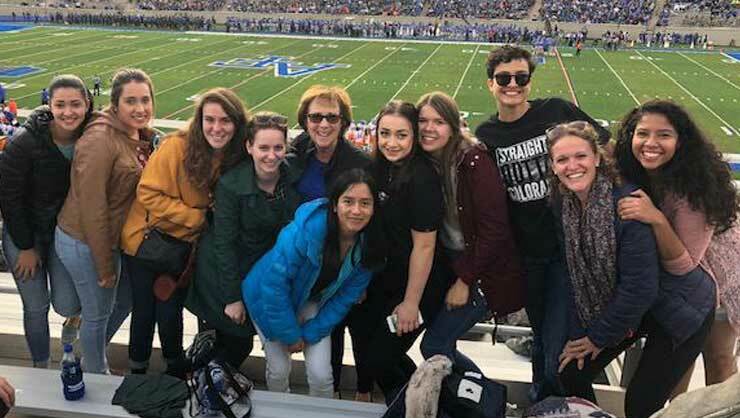 Recently, LC Paula in Denver put together a truly unique experience for her au pairs- they attended a football game at the U.S. Air Force Academy! LC Paula explains below. When planning my events, I like to have the au pairs experience different sports that are typical to the U.S. We had previously been to the University of Colorado for football games, which the au pairs enjoyed, but I wanted to do something different this month. 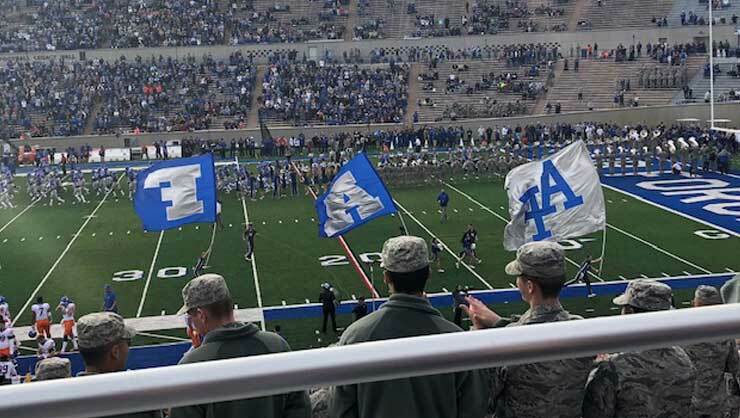 I thought visiting the Air Force Academy would not only give the au pairs the experience of a college football game but also the experience of the ceremony and tradition of the U.S. Air Force Academy and one branch of our military. The football game was full of new experiences for the au pairs. Only one of the au pairs had ever been to a football game at all, let alone one at a military academy! I asked au pair Malu from Brazil what she enjoyed and she said that it wasn't just a football game; it was about the Air Force and its traditions. It was about watching the cadets and their discipline and structure throughout the game. The stands at the game. Another highlight for Malu was the opening ceremony when they parachuted five cadets from a plane and they landed with different banners or flags on the field in front of us. She also loved the fighter jets doing a flyover. She had never seen that before! The things that stood out most for all of the au pairs were the skydivers and the cheerleaders. I don't think they had ever seen skydivers landing on the field in person, nor had they seen cheerleaders in person. One of the au pairs commented that the cheerleaders were just like she had seen in the movies! They were very impressed that the cheerleaders are also cadets and they have to do the same training as the rest of the cadets in addition to their cheerleading practices. The au pairs enjoyed the traditions, the fun music, and the comradery of the cadets. During timeouts, the stadium played lots of popular songs that the au pairs and cadets sang along with, even though they come from different worlds. It was fun to see that music is a universal language! The au pairs liked the event so much that they think it should be an annual cluster meeting! Joy is a huge advocate for cultural exchange. She's lived across the USA, then moved overseas to London and Sydney. She currently resides in Jakarta, Indonesia, giving her a unique perspective on working and thriving in a culture not her own. 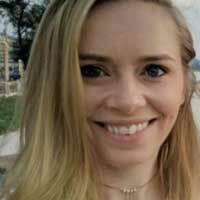 Joy graduated from the University of Sydney with a degree in Marketing and started her career in the au pair industry. She works on the blog and social media for the Au Pair USA program. Bring the world to your family by welcoming an au pair into your home! Host an Au Pair in the U.S. Welcome an international au pair into your home. We have over 25 years of experience as an au pair agency matching happy families and au pairs! We'll be there every step of the way, guiding you as you interview and match with the right au pair, and then providing 24-hour support throughout your year.